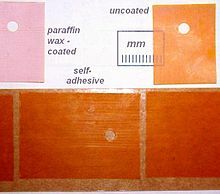 Kapton is a polyimide film developed by DuPont in the late 1960s that remains stable across a wide range of temperatures, from −269 to +400 °C (−452 to 752 °F; 4 to 673 K). Kapton is used in, among other things, flexible printed circuits (flexible electronics) and thermal blankets used on spacecraft, satellites, and various space instruments. The chemical name for Kapton K and HN is poly (4,4'-oxydiphenylene-pyromellitimide). It is produced from the condensation of pyromellitic dianhydride and 4,4'-oxydiphenylamine. Kapton synthesis is an example of the use of a dianhydride in step polymerization. The intermediate polymer, known as a "poly(amic acid)", is soluble because of strong hydrogen bonds to the polar solvents usually employed in the reaction. The ring closure is carried out at high temperatures (200–300 °C (392–572 °F; 473–573 K)). The thermal conductivity of Kapton at temperatures from 0.5 to 5 kelvin is rather high for such low temperatures, κ = 4.638×10−3 T0.5678 W·m−1·K−1. This, together with its good dielectric qualities and its availability as thin sheets have made it a favorite material in cryogenics, as it provides electrical insulation at low thermal gradients. Kapton is regularly used as an insulator in ultra-high vacuum environments due to its low outgassing rate. According to a NASA internal report, space shuttle "wires were coated with an insulator known as Kapton that tended to break down over time, causing short circuits and, potentially, fires." The NASA Jet Propulsion Laboratory has considered Kapton as a good plastic support for solar sails because of its long duration in the space environment. NASA's New Horizons spacecraft used Kapton in an innovative "Thermos bottle" insulation design to keep the craft operating between 10–30 °C (50–86 °F) throughout its more than nine-year, 3 billion mile journey to rendezvous with the dwarf planet Pluto on July 14, 2015. 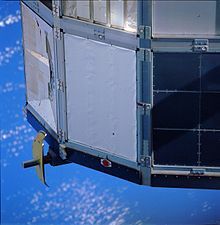 The main body is covered in lightweight, gold-colored, multilayered thermal insulation which holds in heat from operating electronics to keep the spacecraft warm. The thermal blanketing–18 layers of Dacron mesh cloth sandwiched between aluminized Mylar and Kapton film–also helped to protect the craft from micrometeorites. The sunshield of the James Webb Space Telescope is also made of aluminized Kapton. The crew aboard the International Space Station used Kapton tape to temporarily repair a slow leak in a Soyuz spacecraft attached to the Russian segment of the orbital complex in August, 2018. Kapton is also commonly used as a material for windows of all kinds at X-ray sources (synchrotron beam-lines and X-ray tubes) and X-ray detectors. Its high mechanical and thermal stability and high transmittance to X-rays make it the preferred material. It is also relatively insensitive to radiation damage. Kapton tape (yellow) used to insulate the leads of a battery cell in a bluetooth headset. 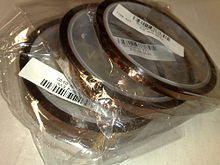 Due to its large range of temperature stability, and its electrical isolation ability, Kapton tape is usually used in electronic manufacturing as an insulation and protection layer on electrostatic sensitive and fragile components. As it can sustain the temperature needed for a reflow soldering operation, its protection is available throughout the whole production process, and Kapton is often still present in the final consumer product. Kapton and ABS adhere to each other very well, which has led to widespread use of Kapton as a build surface for 3D printers. Kapton is laid down on a flat surface and the ABS is extruded on to the Kapton surface. The ABS part being printed will not detach from the build platform as it cools and shrinks, a common cause of print failure by warping of the part. Kapton is a registered trademark of E. I. du Pont de Nemours and Company. ^ Navick, X.-F.; Carty, M.; Chapellier, M.; Chardin, G.; Goldbach, C.; Granelli, R.; Hervé, S.; Karolak, M.; Nollez, G.; Nizery, F.; Riccio, C.; Starzynski, P.; Villar, V. (2004). "Fabrication of ultra-low radioactivity detector holders for Edelweiss-II". NIM A. 520: 189–192. doi:10.1016/j.nima.2003.11.290. ^ Jason Lawrence, A. B. Patel and J. G. Brisson (2000). "The thermal conductivity of Kapton HN between 0.5 and 5 K". Cryogenics. 40 (3): 203–207. doi:10.1016/S0011-2275(00)00028-X. ^ Peter Kittel (30 September 1998). Advances in Cryogenic Engineering. Birkhäuser. pp. 1366–. ISBN 978-0-306-45807-1. Retrieved 29 April 2012. ^ Fatal helicopter crash caused by Kapton wiring www.military.com Retrieved 2015-02-17. ^ Apollo 11 Flight Journal – Day 6 part 4: Trans-Earth Injection. History.nasa.gov (2011-03-15). Retrieved on 2012-04-28. ^ Jerome L. Wright (1 January 1992). Space Sailing. Taylor & Francis US. pp. 100–. ISBN 978-2-88124-842-9. Retrieved 28 April 2012. ^ "Sunshield Membrane Coatings" page at the JWST website. Ngst.gsfc.nasa.gov. Retrieved on 2017-05-23. ^ "ISS Status blog" at NASA website. blogs.nasa.gov/spacestation/2018/08/30/international-space-station-status-2/ Retrieved on 2018-08-30. ^ Janez Megusar (1997). "Low temperature fast-neutron and gamma irradiation of Kapton polyimide films". Journal of Nuclear Materials. 245 (2–3): 185–190. doi:10.1016/S0022-3115(97)00012-3. ^ "Kapton Trademark". United States Patent and Trademark Office. USPTO. Retrieved 3 March 2017. This page was last edited on 25 April 2019, at 21:29 (UTC).